If people end up being able to capitalise on Gilead’s fallibility, it will be because of Serena Joy. In this episode, Commander Waterford takes his wife up to the ‘free country’ in Canada to prove – via diplomatic discussion and the media coverage of the trip – that women are not oppressed in Gilead and that they are actually strong women who are able to voice their opinions. Obviously, this is an absolute joke (and deep-down, Serena knows this, even if she refuses to move out of denial), so we basically see a whole lot of Mrs Waterford trying to keep her sh*t together. To be completely honest, if you don’t feel empathy for Mrs Waterford in this episode, then I don’t think you understand one of the primary messages of the show: political autonomy affects individual agency in ways that we don’t fully appreciate. We have seen in previous episodes that Serena Joy was different before the Gilead regime, but she is now operating within very different societal constructs—The Handmaid’s Tale reveals how the ritualistic nature of normalised routines of behaviour is, in fact, how mass-indoctrination operates. It is not her fault so much as the fault of society’s conditioning of her which made her susceptible to believing in the morality of such a totalitarian regime initially. The series explores the philosophical concept of interpellation: “a process in which we encounter our culture's values and internalize them… the idea that an idea is not simply yours alone but rather an idea that has been presented to you for you to accept.” The existence of the series itself demonstrates the importance of art and the media to keep this process in check. She is also approached by people of Free Canada and tempted into leaving Gilead for good; she is tempted into freedom. Yvonne Strahovsky’s (Serena Joy) way of presenting her character as one who is conflicted – assumedly between her inner desires and the ones she feels compelled to fulfil as a Commander’s Wife – is enticing to the viewer. What does it mean? Is she actually considering it? Is this where Gilead falls apart? Alas, no. Not this time. However – and I think we’ve all secretly been waiting for this moment – the Waterford couple’s reactions to seeing Luke riled up about the sexual abuse and imprisonment of his wife is everything I imagined and more. Obviously, Commander Waterford passes his claims off as misrepresentation and miscommunication in the media (cross-reference THAT comment with a certain President’s proclamations of “fake news” – the Post-Truth era is now, folks). But – with Serena’s reaction? Simply exquisite. Perhaps it’s a reminder of the fact that her own husband would never do the same for her anymore (ie. care as much for her wellbeing). Perhaps it is because of this that we see Mrs Waterford desperately trying to convince herself that what the Gilead regime is doing is righteous and noble. This hope is somewhat dismantled when the letters get out. Remember these? Thanks to Nick (who smuggles the letters into Canada with him and gives them to Luke), the primary accounts of the Gilead-inflicted oppression are published in the public domain. Chaos ensues, and the Waterford couple are notified that they are no longer welcome in Canada; they must return home. An initial assumption of the episode and its title, “Smart Power”, could lead a viewer to believe that it is Commander Waterford’s wily diplomacy that constitutes this kind of power. I implore you, however, to reconsider, particularly in light of Offred’s power manipulations towards the end of the episode. As we know, Offred is in a compromising situation (to say the least) – aside from the routine sexual assault she endures, at the beginning of this episode Mrs Waterford tells Offred that she is to be removed from the house as soon as the baby is born. Then, when she inquires into the location of the Waterford business trip, the trip to a free country is left dangling tantalisingly in front of her. But that doesn’t stop her from wreaking a havoc of her own while the Waterford couple are gone. Middle: Aunt Lydia totally taking the bait. 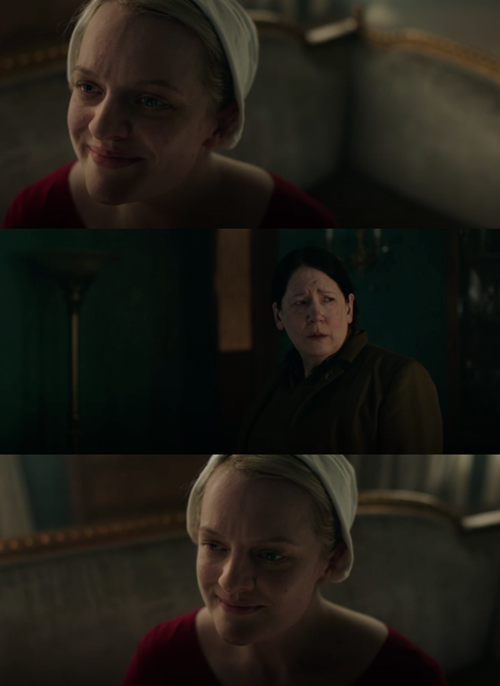 In a most devious and cunning turn of events, Offred asks Aunt Lydia to be the Godmother of (and thus protect) her unborn child. Offred explains – her dialogue loaded with a menacing subtext – that she is concerned for the wellbeing of her child, given the unsafe environment of the Waterford household. And she absolutely drops Commander Waterford in it, saying that “a man who hurts women [referring to the corporal punishment he inflicted on his wife], will likely also hurt children”. If she can’t have her own child, then neither can they. Finally, I will leave you with the sense of hope and determination that I felt at the end of watching this episode. When the Waterford couple return with Nick, Nick goes to Offred and tells her everything that happened in Canada, everything that happened with the letters, everything that Luke told him to say to her, and the fact that Moira successfully escaped from Gilead. The fact that “Moira achieved the impossible” gives June hope, and it gives us hope. June is not standing for it anymore. Jun 23 A Final Goodbye?